The Property Brothers and other Canadian celebs are all taking part! If you're looking to stay warm while also supporting a great cause this winter, it might be time to make a trip to Roots. 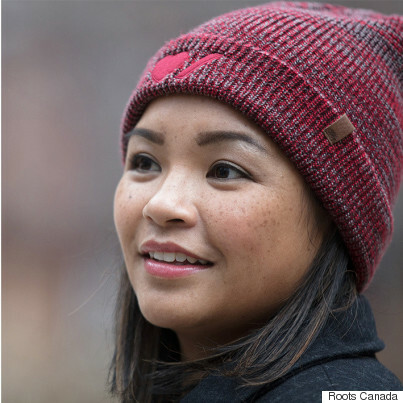 The Canadian clothing retailer is teaming up with Heart & Stroke to release a limited number of toques to support Heart Month. "Teaming up with an iconic brand like Roots during Heart Month will help raise awareness about the devastating impact that heart disease and stroke has on Canadians," Heart & Stroke's chief marketing and communications officer Geoff Craig said in a release. "In conversations with Roots, we discovered we share a passion for fighting heart disease and stroke, and a common vision for healthy lives." And for many Roots employees, the matter is personal, according to CEO Jim Gabel. "Roots is involved because heart disease tragically affects many of our employees, their families, our customers and communities coast-to-coast," he said. "We believe through direct work with Heart & Stroke we can increase awareness and make a genuine difference in finding solutions to combat these terrible diseases." A number of Canadian celebs, including "The Property Brothers" stars Jonathan and Drew Scott, Jason Priestley and music group Dragonette are also taking part in the campaign on social media, using the hashtag #MoreMoments to raise awareness about heart health. Doing 2 things we love most! Magic & raising awareness for preventable health risks like heart disease and stroke. Create #MoreMoments to laugh and spend time with loved ones by living a healthy and active lifestyle! But if toques aren't quite your thing, Roots also offers a Heart & Stroke leather bracelet that will benefit the campaign. Head over to Roots.com to get your hands on the limited edition collection.